One in three people has a genetic variant that significantly raises the risk of colorectal cancer from eating processed and red meat, new research shows. In addition to identifying a gene that raises risk for colorectal cancer from eating red or processed meat, the study—the first to identify the interactions of genes and diet on a genome-wide scale—also reveals another specific genetic variation that appears to modify whether eating more vegetables, fruits, and fiber actually lowers your colorectal cancer risk. “Diet is a modifiable risk factor for colorectal cancer. Our study is the first to understand whether some individuals are at higher or lower risk based on their genomic profile. This information can help us better understand the biology and maybe in the future lead to targeted prevention strategies,” says lead author Jane Figueiredo, assistant professor of preventive medicine at the Keck School of Medicine of University of Southern California. The researchers present their findings at the annual American Society of Human Genetics 2013 meeting. We’ve all heard reports about how certain foods may lower or raise the risk for certain diseases, such as cancer. But how our personal genetic variations modify the effects of diet on disease has not yet been thoroughly investigated, says senior author Ulrike Peters of the Fred Hutchinson Cancer Research Center’s Public Health Sciences Division. The researchers systematically searched the more than 2.7 million genetic sequences for interactions with consumption of red and processed meat. The study looked at 9,287 patients with colorectal cancer and a control group of 9,117 individuals without cancer. The risk of colorectal cancer associated with processed meat was significantly higher among people with the genetic variant rs4143094, the study shows. This variant is located on the same chromosome 10 region that includes GATA3, a transcription factor gene previously linked to several forms of cancer. The transcription factor encoded by this gene normally plays a role in the immune system, but carries this genetic variant in about 36 percent of the population. 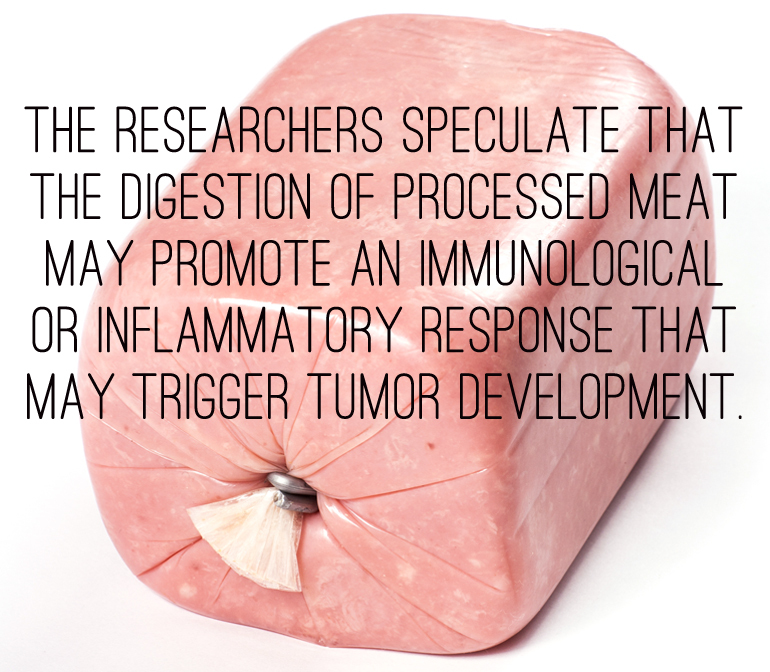 The researchers speculate that the digestion of processed meat may promote an immunological or inflammatory response that may trigger tumor development. The GATA3 transcription factor normally would help suppress the immunological or inflammatory response. However, if the GATA3 gene region contains a genetic variant, it may encode a dysregulated transcription factor that impacts its ability to suppress the response. But other genetic variants may be beneficial: On chromosome 8, another statistically significant diet-gene interaction was found in variant rs1269486. For people with this variant, eating fruits and veggies may be even better when it comes to colorectal cancer risk, the research shows. The study is part of an ongoing collaboration among multiple institutions worldwide, the international NIH-funded Genetics and Epidemiology of Colorectal Cancer Consortium (GECCO). “GECCO aims to continue to discover additional colorectal cancer-related variants by investigating how genetic variants are modified by other environmental and lifestyle risk factors, including biomarkers as well as how they influence patient treatment response and survival,” Peters says, emphasizing how much further research is required to uncover the specific mechanisms by which genes modulate the intake of certain foods on colorectal cancer risk. Colorectal cancer is a multi-factorial disease attributed to lifestyle, environmental, and genetic causes, and the third leading cause of cancer death in both men and women across most racial groups. Over 30 genetic susceptibility alleles for colorectal cancer have been pinpointed throughout the genome. They include rare variants that have a strong impact on risk and common variants that are low risk. Li Hsu of the Fred Hutchinson Cancer Research Center is the study’s lead biostatistician. Major funders include the National Cancer Institute of the National Institutes of Health.